The User Roles feature provides the ability to search, add, and manage users in your defined roles. Note: To be able to assign of internal roles to external users, you will need to enable Just-in-time (JIT) provisioning in the Security Settings. That will enable the application to create an internal application user based on an external user's information. 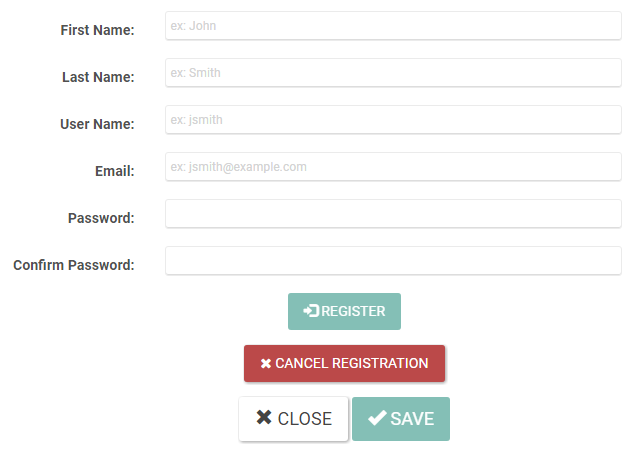 Click + Register New User to open the new user registration form. Fill in the First Name, Last Name, User Name, and Email. Enter a password in the Password field and then enter it again in the Confirm Password field. Start typing the name of a user. The list will update to show the matching user(s). Click Refresh to refresh the user list. Locate the row for the User whose roles you want to edit and click Edit (pencil icon). Select the roles you want to add the user to by clicking the checkmark in the far left field beside the Role. To remove the user from a role, click the checkmark to uncheck it. Locate the row for the user you wish to delete and click the Delete icon. Click Delete in the confirmation popup. In the users list, find the users you wish to delete and click the checkmarks to the left of them. Click Delete Selected in the Template table header.